Today, Monday, November 12, is Veterans Day in the United States, a day to honor men and women who have served in the US Armed Forces. It isn’t always easy for veterans to reacclimatize to civilian life, after the horrors and traumas of combat. Nor is it necessarily simple for veterans to find employment. One refreshing trend we’re seeing, though, is that a number of former military personnel from a variety of countries are getting involved in helping protect wildlife. The work allows veterans to pursue the kind of service-oriented work that drew them to the military in the first place, as well as use the training they received in the military effectively as part of an anti-poaching force for good. 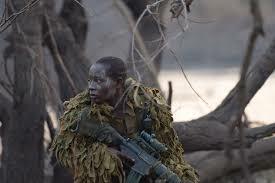 Akashinga ranger in Zimbabwe's all-women anti-poaching unit. “When I returned to civilian life after the Marine Corps, I lost myself,” said Ryan Tate, founder of Veterans Empowered To Protect African Wildlife (VETPAW). “I didn't really know what I was here for. Learning about the brutality of the poaching crisis and the rangers who are dying protecting wildlife, hit me harder than anything I'd ever seen — and I've seen some crazy stuff. I realized I have the skills necessary to help save animals and the people who risk their lives daily." That’s when Tate knew he wanted to create VETPAW. Over three years, ex-Australian Special Operations sniper Damien Mander did 12 tours of duty in Iraq. Ten years ago he re-settled to southern Africa, where he is now leading one of the planet’s more unique projects: the International Anti-Poaching Foundation. The IAPF provides training to park rangers — but it focuses on all-women anti-poaching units.